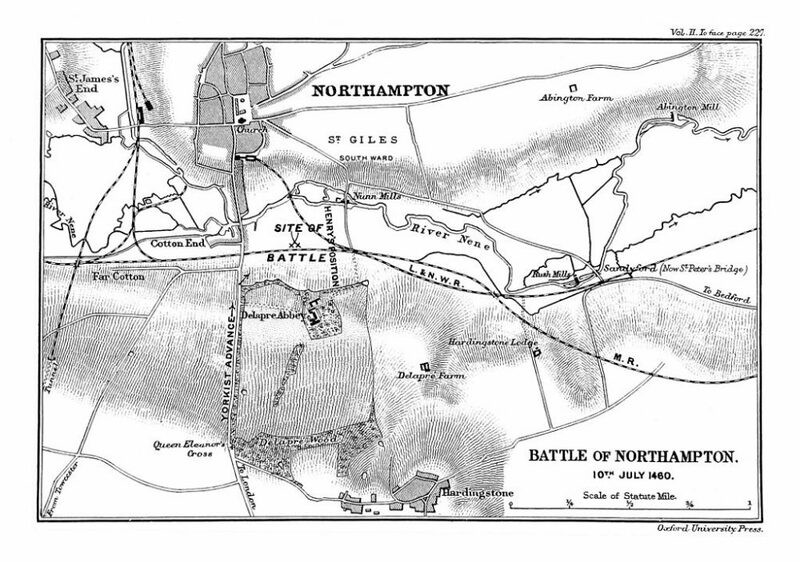 The Battle of Northampton took place on 10th July 1460. It was a Yorkist victory that reversed the fortunes of their cause in the Wars of the Roses. After spending time in exile, the Yorkists returned to England. At Northampton they defeated the Lancastrian army, captured King Henry VI and killed several leading Lancastrians. The battle led to Richard, Duke of York, being named heir. Following Ludford Bridge the main Yorkist leaders had been forced into exile. Richard, Duke of York, had gone to Ireland. Earls Salisbury and Warwick, to Calais. The Lancastrian faction attempted to kill off any hopes of a Yorkist resurgence. Attempts were made to capture Calais. These were rebuffed by a strong force that remained loyal to Warwick. In January 1460 a raiding party of Yorkist troops attacked Sandwich. 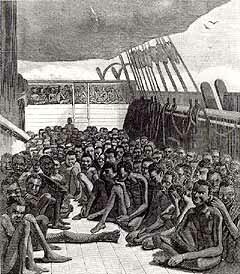 Here they captured the Lancastrian fleet and Earl Rivers. Having captured the Lancastrian fleet, the Yorkists had control of the English Channel. Warwick sailed, unopposed, to meet with Richard Duke of York, in Ireland. Here they planned their next move. In June 1460 the Yorkists once again landed at Sandwich. This was no raiding party. A force of around 1200 men landed, took the town and held it. After shoring up the towns defenses, Warwick, Fauconberg and Salisbury landed, on 26th June. After securing a base in Sandwich the Yorkists moved north. 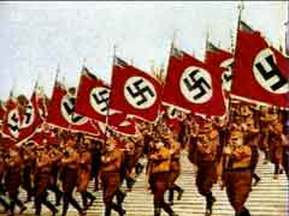 An initial force numbering fewer than 2000 men soon grew. Lancastrian commanders in Canterbury changed allegiances. Supporters of the Yorkist faction joined as the army moved to London. 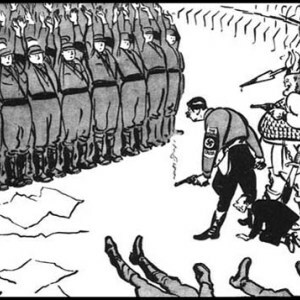 Upon arriving at the capital, the force is said to have numbered at least 20000. The Lancastrian Commander withdrew his forces into the Tower of London. The Yorkists entered London on 2nd July. They did not did not stay long. On 4th July, the bulk of the army marched North. Earl Salisbury remained in London and besieged the Tower of London. The Lancastrians knew that the Yorkist army was on the march. They moved from Coventry to Northampton. Here, they built a fortified camp which was surrounded by a small moat. The camp was defended by cannon and had the River Nene to its rear. The Yorkists maintained that they had no argument with the King himself. It was the counsellors with whom they claimed to have issue. Attempts at Parley were made by the Yorkists. They were refused by the Duke of Buckingham who would not allow the heralds access to the King. After several attempts, Warwick informed the Lancastrians that they would be attacked at 2pm if no agreement had been made. The Yorkist army assaulted the Lancastrian position. As it advanced, the Lancastrians did not fire their cannon. The reasons are unknown but it is possible that the gunpowder had become damp. As they reached the barricade one of the defenders, Lord Grey, switched sides. His men joined the Yorkists and this gave the attacking force a large breech in the defenses into which they could advance. With a river behind them and surrounded by their own defensive moat, the Lancastrians could not form up effectively. Many men fled the battlefield: the River Nene is not all that deep. Around the Kings quarters, a number of leading Lancastrian lords were slain. Their number included the Duke of Buckingham, Thomas Percy, the Earl of Shrewsbury and Lord Beaumont. The King was left stranded in his tent. Once again, he was captured by Yorkist troops. The Battle was quite short. Relatively few are believed to have died. The consequences were great. Once again the king was in captivity. The Yorkists had killed many of their leading opponents. King Henry VI was still reigning though and his queen was at large. Richard Duke of York returned to England shortly after the Battle of Northampton. A compromise was made with a view to settling the conflict. Henry would be allowed to continue his rule. However, Richard was now named as heir, with inheritance to pass through him to his sons. Prince Edward was excluded from inheriting the throne. Infographic: What happened in the Wars of the Roses?